“Nothing haunts us like the things we didn’t buy”. When I recently came across this quote from Kenneth Cole, it seemed rather bourgeois and mundane and I was embarrassed to add it to my list of quotes on Pinterest. But there is something that haunts me that I didn’t buy, a cameo pendant of The Three Graces that I discovered in a hotel lobby gift shop display case. The hotel was in Rome. It was 1969 and we were traveling as a family, my parents bravely taking all four of us on “the trip” through Europe, that my grandparents had offered to subsidize, as long as they didn’t have to come along. It was a six week adventure involving five countries traversed by air, land and sea. I didn’t have the money for the necklace so I begged, offering all my allowance forever. While they graciously considered buying it for me, my father admitted only much later that they spent half of the money they’d brought for the trip on the first night’s dinner in Athens. So while my brother and sisters ventured out through the streets and returned with a bounty of Corgi cars from a tiny toy store they’d located some distance from the hotel (a Ferrari and a Lotus), I eyed my lost treasure ruefully for the few days we were in Rome. My 15 year old self was bereft. I have never forgotten this piece. I imagined I would find the three Graces again somewhere, someday. And I did, over and over again. 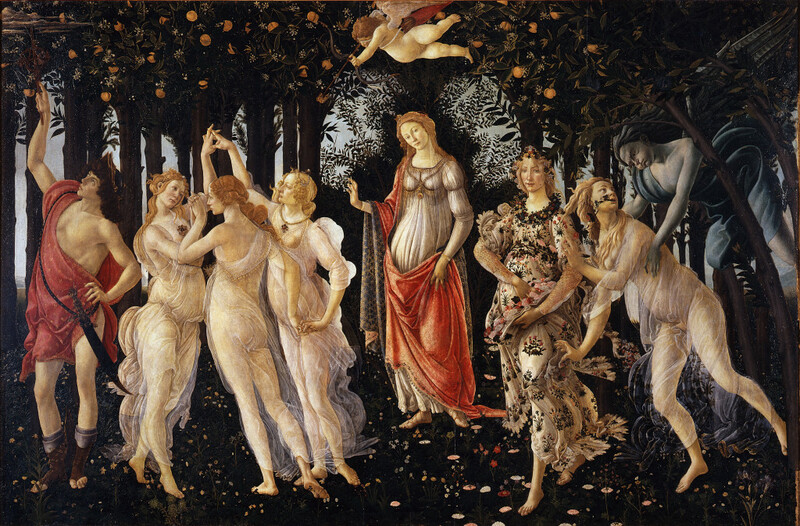 In fact Euphrosyne, Aglaea, and Thalia found me in art history classes in college (pictured here in Sandro Botticelli‘s “Primavera” c.1482), they appeared in my painting (an homage) after grad school, and most recently I realized while writing this, they are the wallpaper on my iphone. These mythological Greek goddesses, the daughters of Zeus and Mnemosyne (the personification of memory), are considered the inspiration for literature, science, and the arts. They are messengers, gatekeepers, and direct contacts to Source. And they are my Muses!